The 320-odd million years of the Paleozoic era saw many important events, including the development of most invertebrate groups, life's conquest of land, the evolution of fish, reptiles, insects, and vascular plants, the formation of the supercontinent of Pangea, and no less than two distinct ice ages. The earth rotated faster than it does today so days were shorter, and the nearer moon meant stronger tides. Many organisms evolve, and grow backbones. Basically, a lot of species began to evolve. Unfortunetly, a mass extinction took place near the end of the era and destroyed as much as 95% of the ocean life. 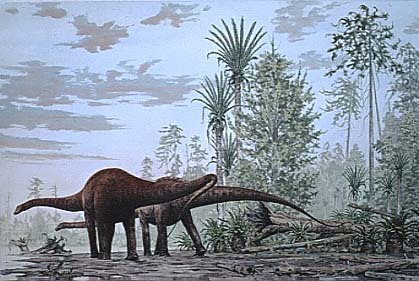 the Mesozoic Era was a time of tectonic, climatic and evolutionary activity. the continents gradually shifted from a state of connectedness into their present configuration; the drifting provided for speciation and other important evolutionary developments. the climate was exceptionally warm throughout the period, also playing an important role in the evolution and diversification of new animal species. by the end of the era, the basis of modern life was in place. At the beginning of the Mesozoic Era all the continents moved together to form a huge supercontinent, Pangaea. This meant, for example, that animals of the Mesozoic living in what is today east Africa could stroll over to Brazil without getting their feet wet! As time went on, Pangaea split up and continents went their own way, severing links among previously connected land masses. An event that happened would be the ending of the Ice age and the beginning of mammals and plants, or even the formations of the major landforms we have today. Such as the beginning of the Alps, or the Himalayas. The pollen and fruit count even increased through the Cenozoic Era.